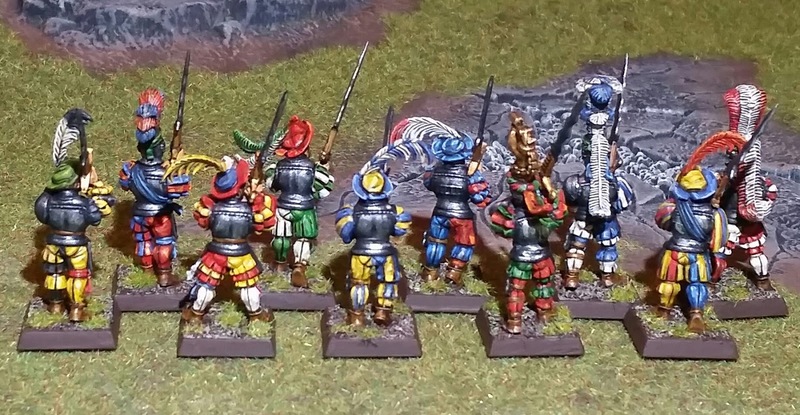 Although my previous post had me saying it would be likely my last for the year, I ended up finding a great deal on ebay for these GW Greatswords. 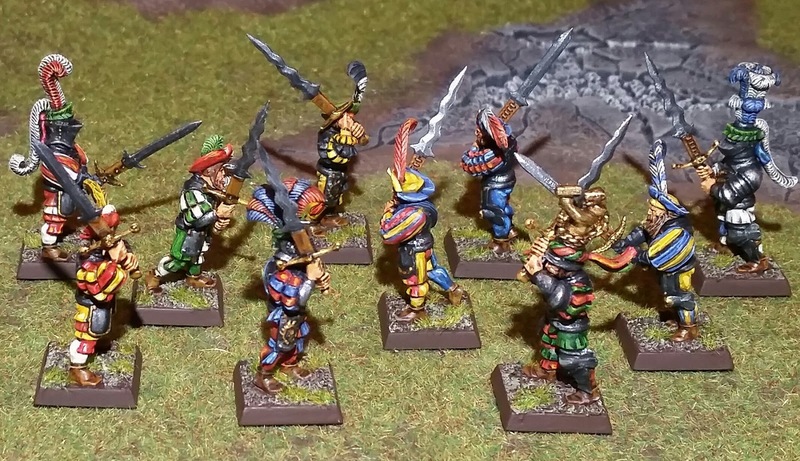 As I plan to attend a Dragon Rampant game day next month, I figured these could be used for a unit of foot as an option. 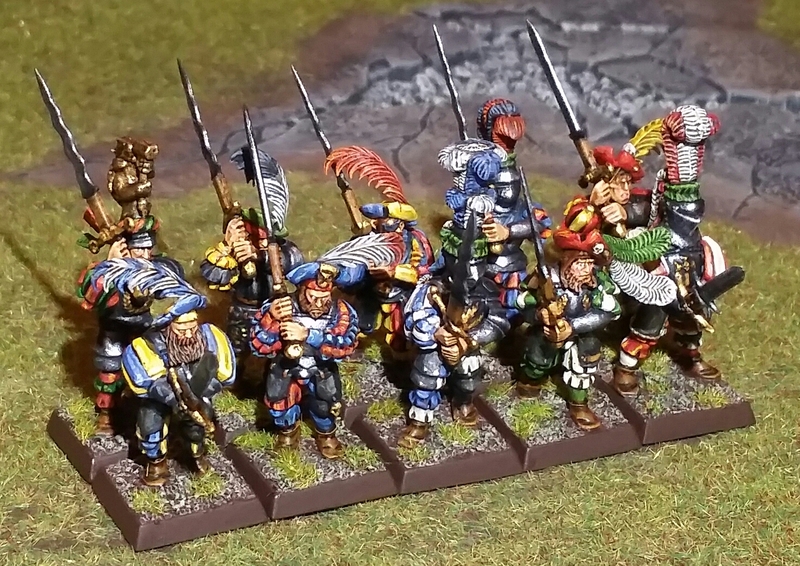 Plus, I always wanted to paint up this set - basically Landsknechts, but with that GW "heroic" style of sculpting. The helmeted heads are left over bits from a Knights kit I painted several years ago - glad I kept them. 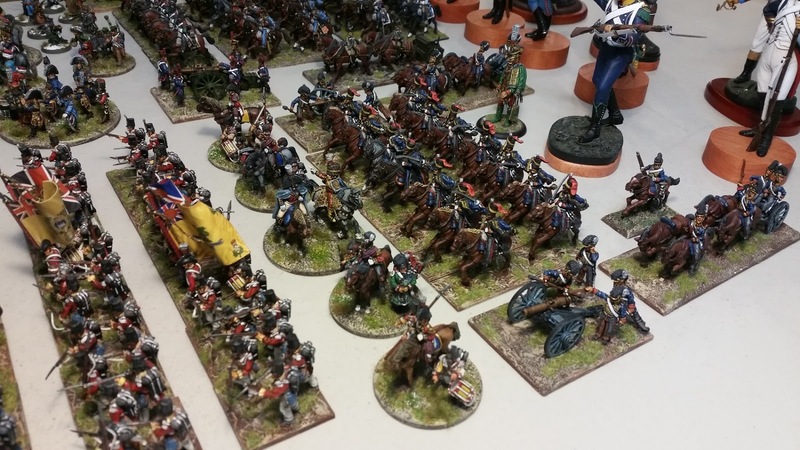 The colors could be from Empire states, but with Landsknechts, the sky's the limit with color combinations. I painted these without the use of Minwax stain as the last can had dried up and I wanted to experiment using Pledge (Future) floor wax mixed with some ink stain. It worked out okay, and had the benefit of not leaving a high gloss finish, as well as a much quicker drying time. The floor wax dries to an almost flat finish - which I ended up giving a very light coat of Testors Dullcote. 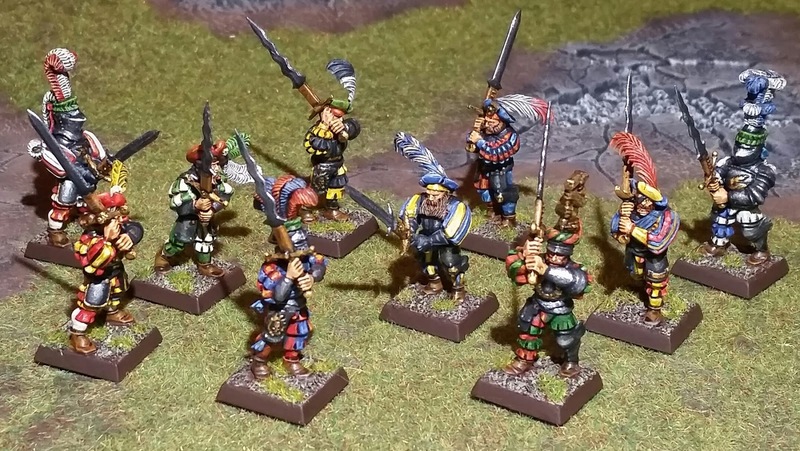 Along with a couple of previously painted figures, these will be used in a Heavy Foot unit at next month's game day. Landsknects are a great way to use a lot of color combinations without fear of going over the top. 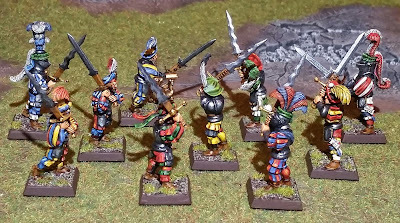 Not only the colors, but the huge two-handed swords, particularly the wavy "flame" bladed ones, make Lanksnects very cool. Thanks for stopping by and hope you all had a great Christmas, and wishing you all a great 2018! Wishing you all the best during the Christmas season. This will likely be my last post for 2017, as I have no projects in mind. 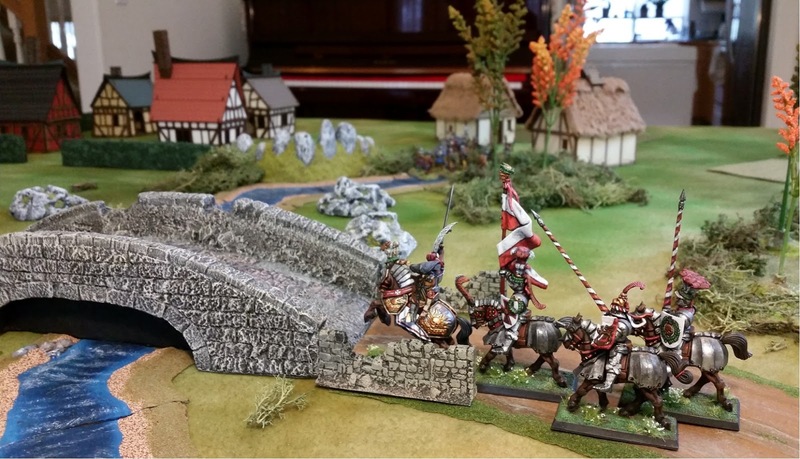 I am slated to participate in a Dragon Rampant game day in January though. Until then, I will make forays into your blogs! 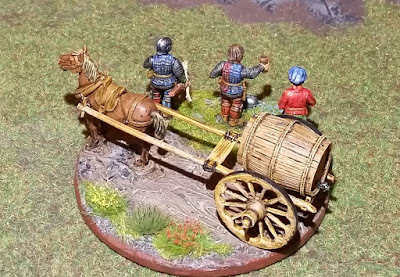 Feeling guilty when ordering just a few plastic WotR spare horses, I added the Water/Wine Cart set to the order. 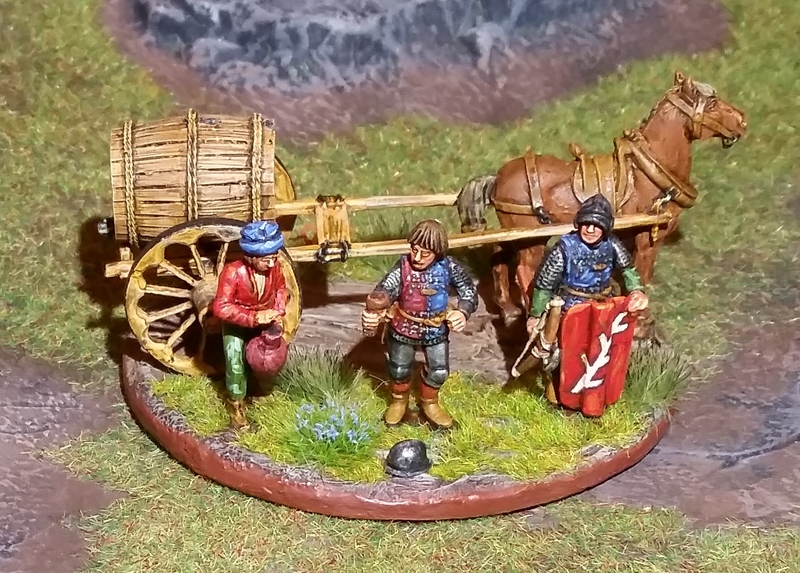 A couple of spare plastic figures to create a vignette - possibly a scene prior to, or after, a battle. The wooden cup is made from Green Stuff. Having thrown away the can of dried up Minwax stain, I used some old (almost 10 years old) Pledge Floor Wax mixed with some sepia ink for the wash. It worked okay, but I would definitely get another can of Minwax for larger projects. I may add something to the rear of the base - maybe a dog or some weapons and/or shields. 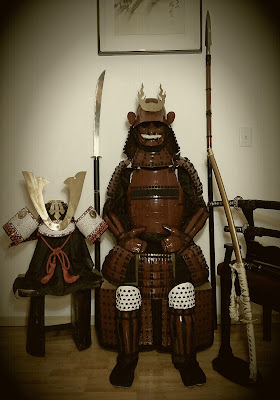 Not sure what this piece would be used for in a game; maybe something to capture for victory points. 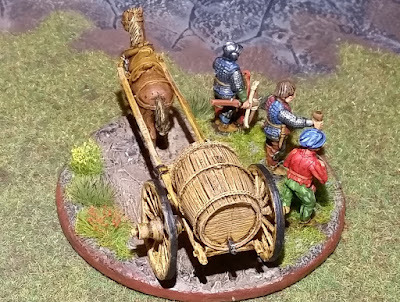 The pavise is painted up to represent the ragged staff of Warwick. 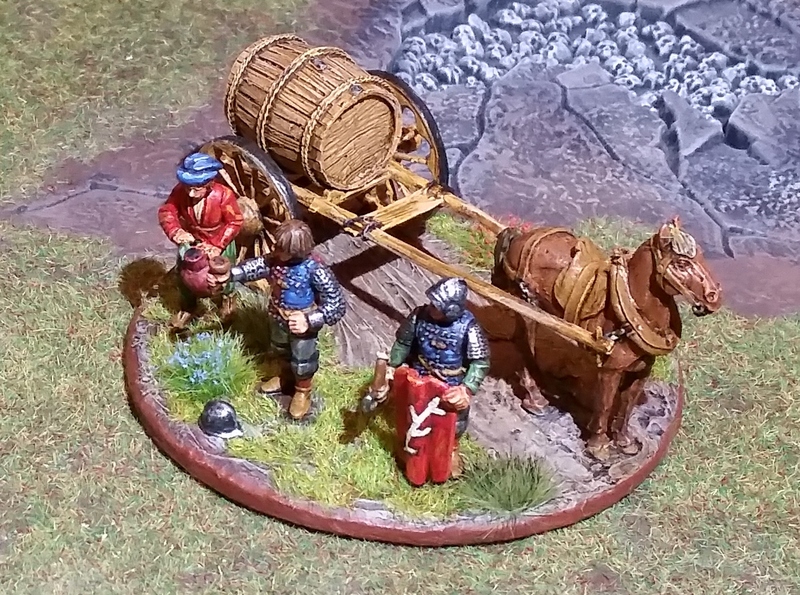 The barrel is cast from resin. 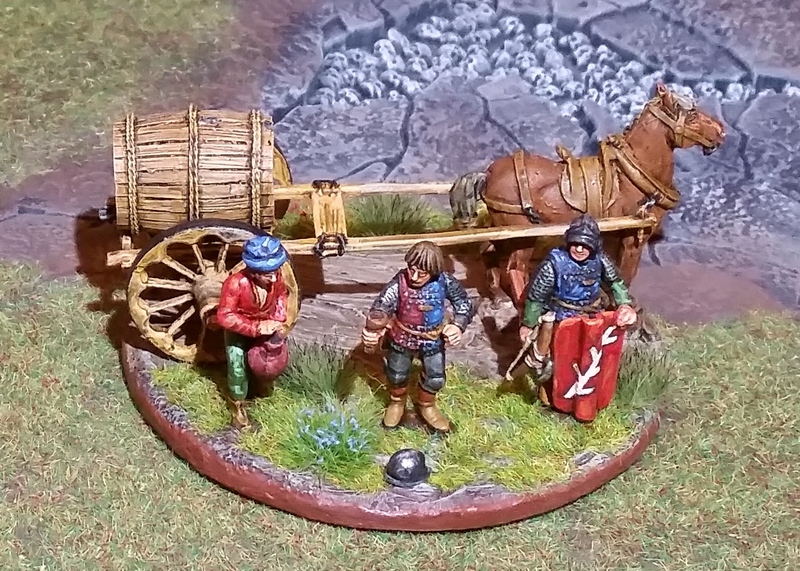 These are likely the last figures to be painted for 2017. 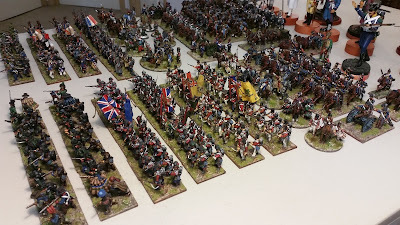 No idea what the next project(s) could be, but don't plan on adding anymore Wars of the Roses stuff as there are enough for the games they're to be used in. 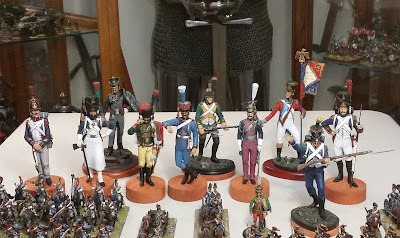 Decided to dust the cabinet shelves and formed up the remaining Napoleonic figures in my collection for review. Earlier in the year, I sold off over half of my Napoleonic figures to local gamers. 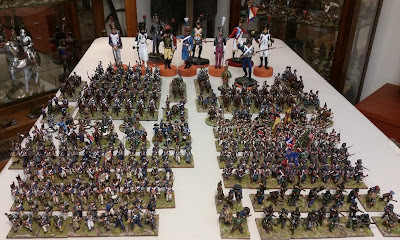 I ended up keeping most of the Victrix and Perry figures - mainly plastics. 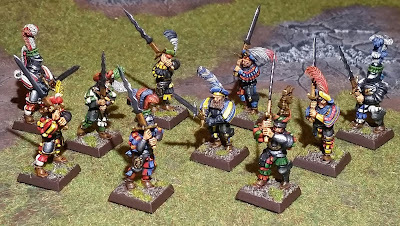 There are still enough figures for smallish games - possibly something along the lines of The Men Who Would Be Kings (although I've yet to get a copy of the rules). 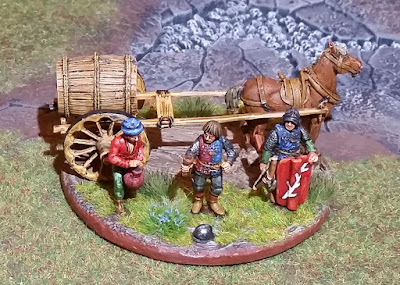 Here they are for a photo op, along with 120mm resin figures which were painted years ago (before getting into wargaming). 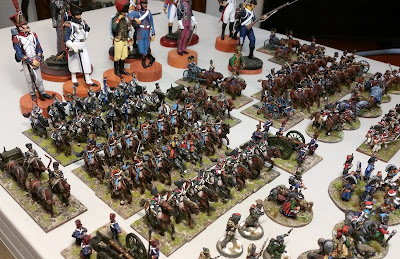 The figures have been posted on this blog before, so pardon my indulgence. 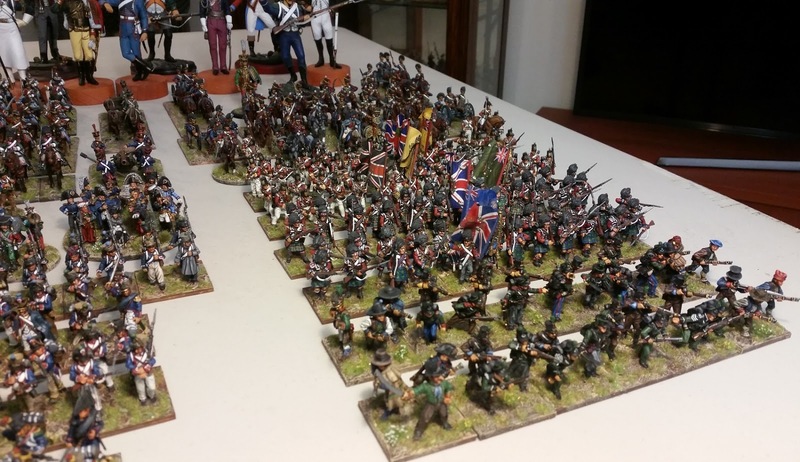 As you can see, only French and British troops remain, with a few Front Rank Spanish Freedom Fighters. 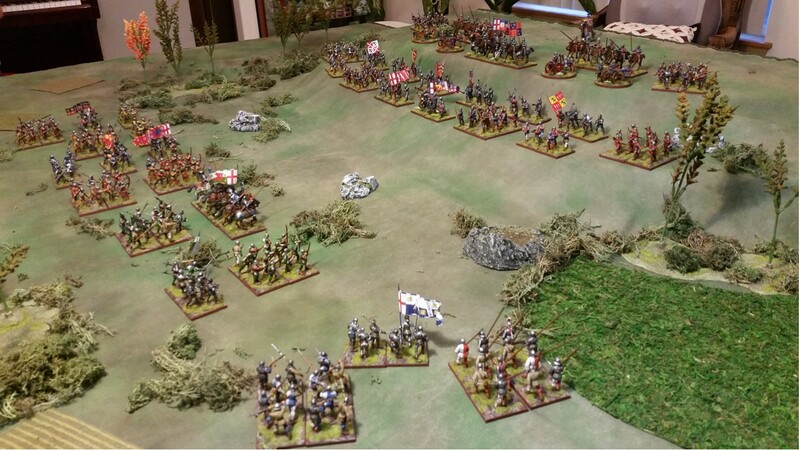 My interest had been mainly Peninisular War - up to the Battle of Toulouse. 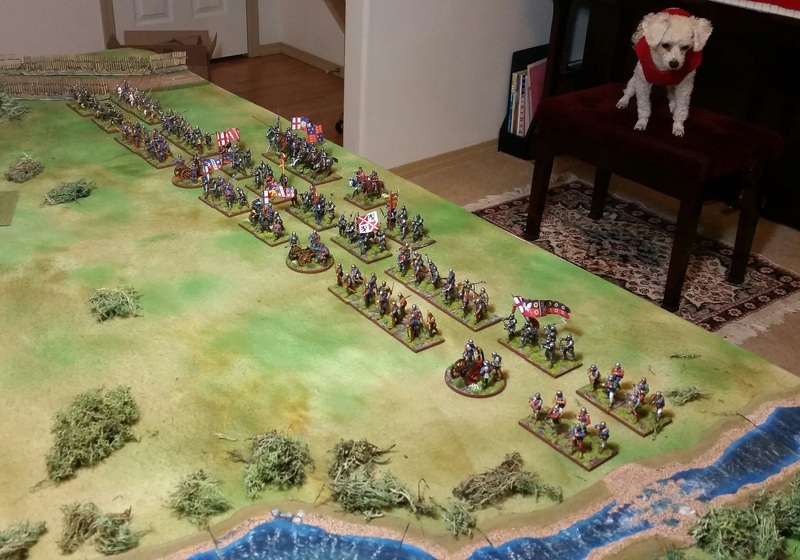 British: 5/60th and 95th Rifles (with a few Victrix Cacadores); 42nd and 79th Highlanders; 28th and 3rd Foot; RHA; and 1st KGL Hussars. Front Rank Spaniards flanking the 95th and 5/60th Rifles; all in front of line battalions. 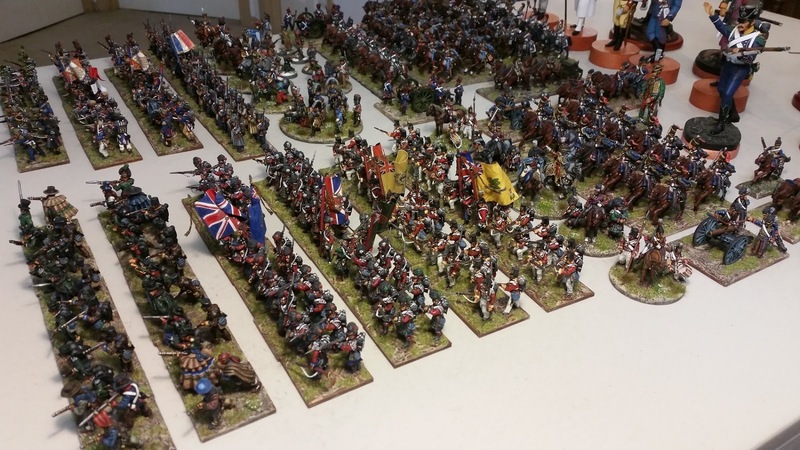 Command stands are mostly Victrix; the largest stand holds a Front Rank and an old North Star/Copplestone Hussar general. The limbers are Old Glory. 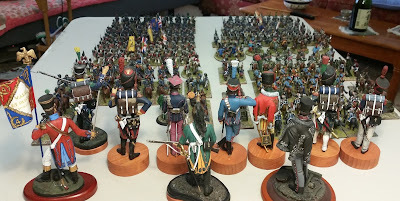 French Ligne and Legere battalions. 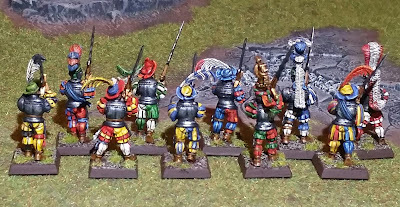 The command stands are mostly Victrix with a few Front Rank; also a set of Foundry Napoleon and Staff. In the rear of them is a Marshal Ney figure from Gorgon, along with some Perry Retreat from Moscow figs. Dragoons, 9th Hussars, Cuirassiers and Carabiniers; the cannon and crews are Sash & Saber; limber teams are Old Glory. Mostly Verlinden 120mm resin figures. Left to right: Line Grenadier; Guard Foot Chasseur Sapper; Lieb Hussar; Guard Chasseur a Cheval; Trumpeter, Guard Artillery Train; Foot Dragoon; 1st Polish Lancers; 4th Swiss; Legere; Guard Grenadier. An old 54mm Stadden lead figure painted up as a Baden Hussar in front of the Lancer. Apparently, I didn't have an appreciation for British troops at the time. Might've been due to their lack of variety in uniforms. Anyway, it's a good time to dust the shelves - my significant other is out with her friends doing some Black Friday shopping. Cheers! Here are several Perry Wars of the Roses mounted characters which I picked up from my buddy Ron back in September at a Lion Rampant game day. 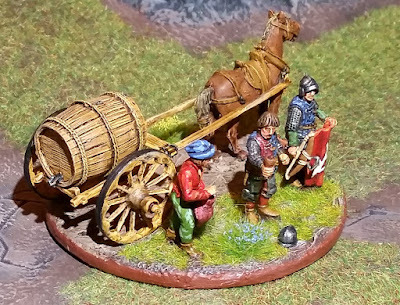 They consist of figures from the Yorkist and Lancaster packs - only five figures as he must've kept the cool rearing horse "Warwick" figure. 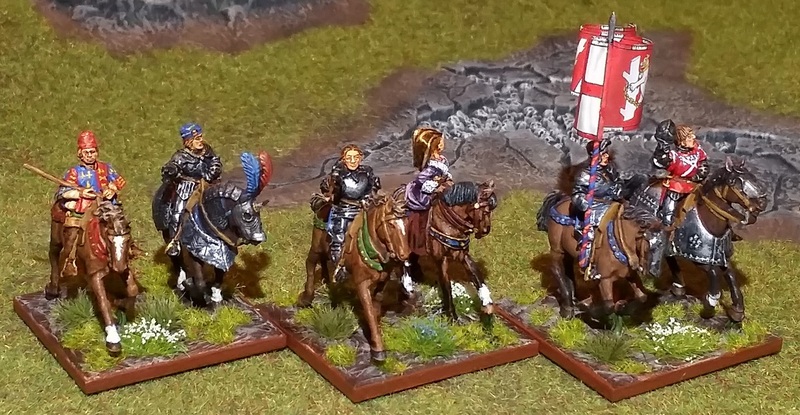 He sold them to me without the horses, so I ordered some of the plastic horses from the Perrys' accessories range. 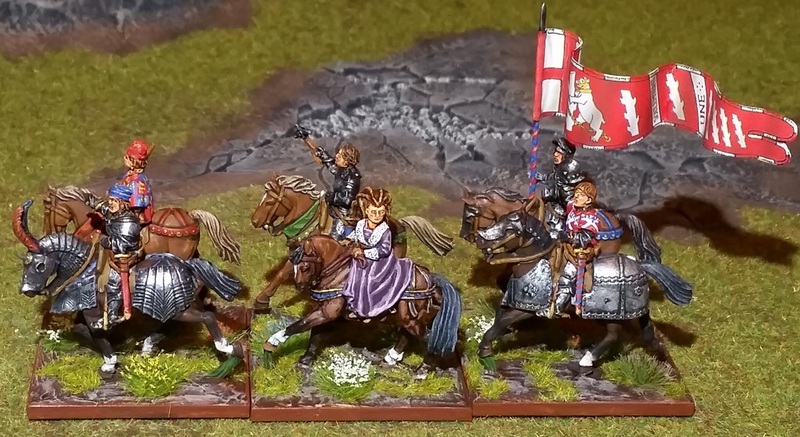 The figures were actually painted several weeks ago, but I just received the order of horses a few days ago. 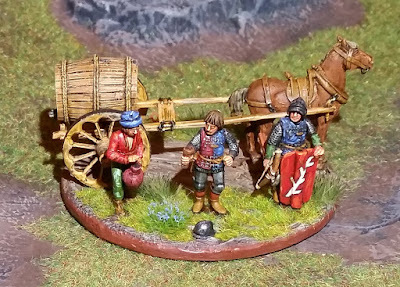 Here they are with a previously painted Queen Margaret figure. 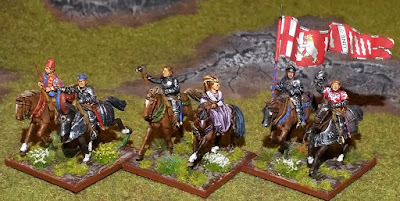 Left to right: Herald with a majestic-looking Henry VI; Duke of Somerset with Queen Margaret prior to the Battle of Tewkesbury; Richard Neville, Earl of Warwick and his standard bearer at the Battle of Barnet. 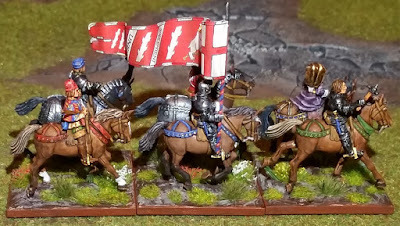 The plate barding on Henry VI's and the Earl of Warwick's horses are spare parts from the Mounted Men at Arms box. 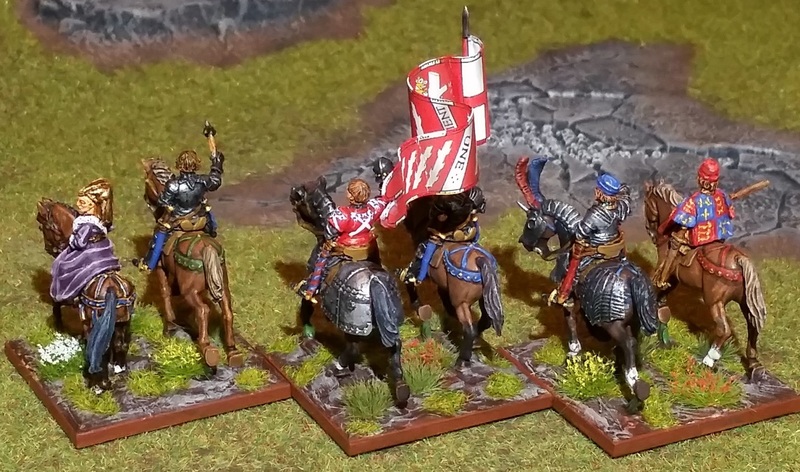 How they might have looked if they were victorious over Edward IV at Barnet. 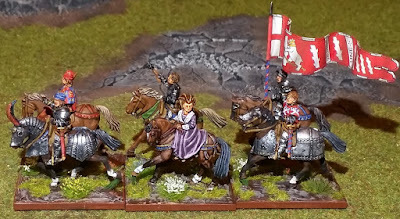 The horses were blocked painted and then given a wash of Minwax Tudor Satin stain. The can of stain was already almost dried and thinner was added to soften it. However, the stain ended up having a bunch of globules which had to be brushed off. The can was thrown away afterwards. The plate barding for the Kingmaker was cut in half - fore and aft to allow proper seating of the figure. The cantels of the saddles on the plastic horses were trimmed off as the metal mounted figures have this piece cast as part of the figures. Otherwise, the fit is very good. 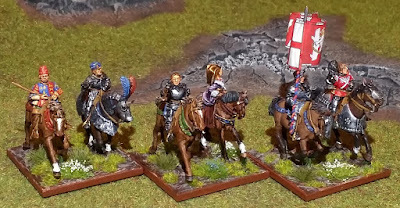 An earlier painted Henry VI and Duke of Buckingham as they might've appeared at First St Albans are on the far right. The past few weeks have been quite hectic with heavy winds blowing down our backyard fence (15 years old with rotten posts) and also a minor fender bender to my car - both since repaired (insurance covered most of it), so happy to get this post onto the blog. Holiday cheers to all! Since the table was already set-up, went ahead and configured the terrain for a Battle of Tewkesbury scenario using Lion Rampant. I took some liberties with the terrain. The units are placed a bit closer - for the photo op; but there is still 12" on either side of the long ends of the table, so they can easily be moved further apart (min. 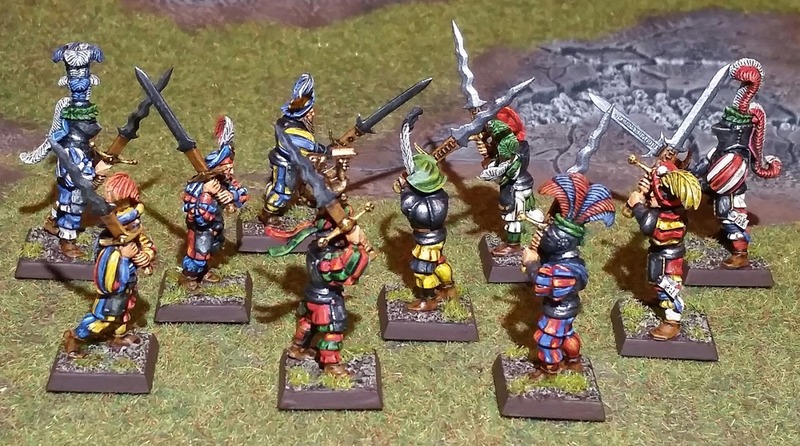 3" between units rule). 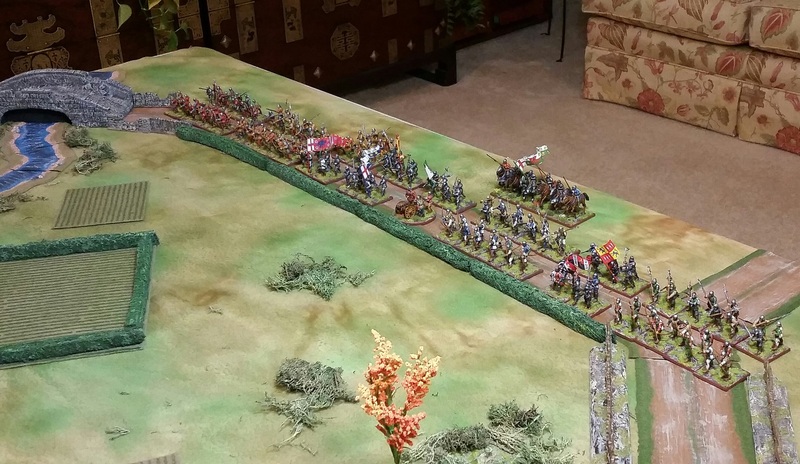 Plan to run this game at next year's Enfilade on Saturday ( morning & afternoon periods). 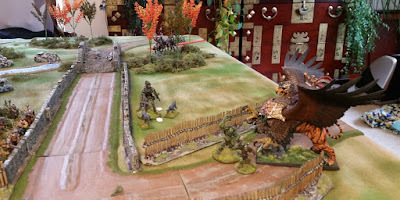 It's a ways out, I know, but I like to have things ready early on, then just have to refresh myself with the scenario and rules as the actual date gets closer. 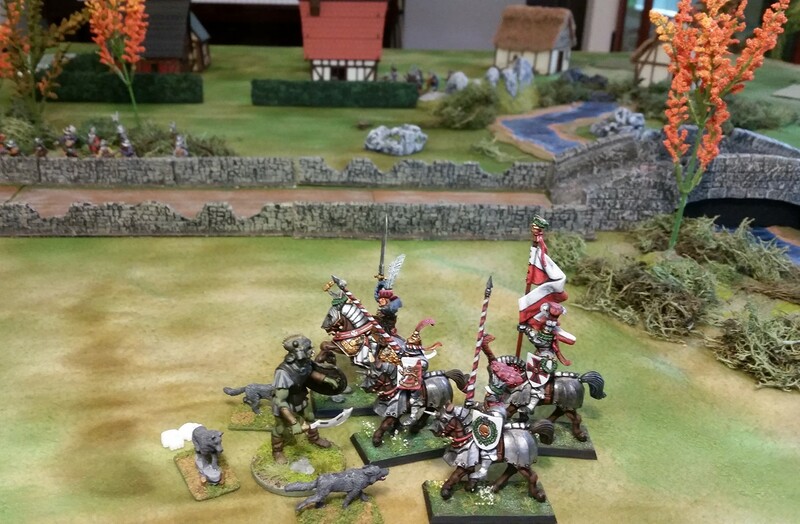 Note the mounted spearmen emerging out of the woods - these will be the troops Edward IV stationed there. In actual game play, they will be able to enter on either side of the short ends of table, about midway - just to give an element of surprise. 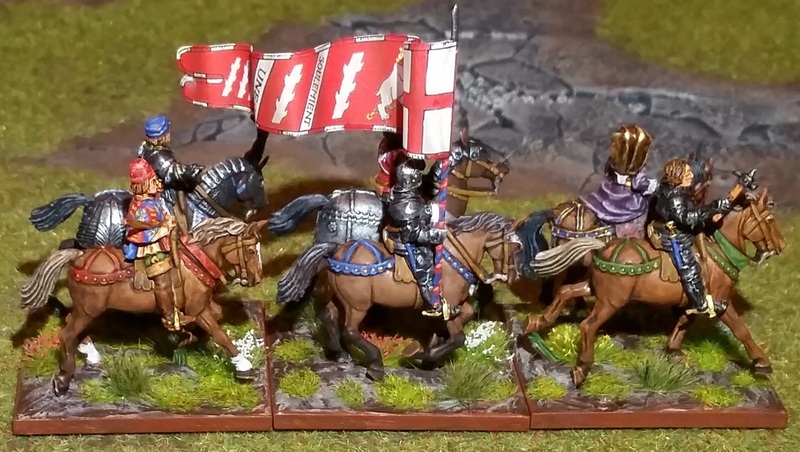 I've given up on trying to stay strictly historical with the use of standards and banners. For instance, those of the Earl of Warwick are present at this battle, although he had been killed not long before at Barnet. 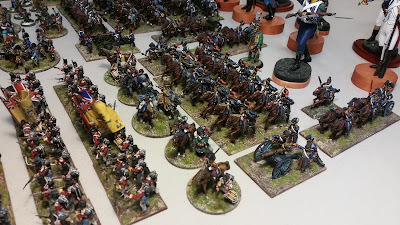 There were just too many deaths of the nobility between battles, not to mention the switching of sides. 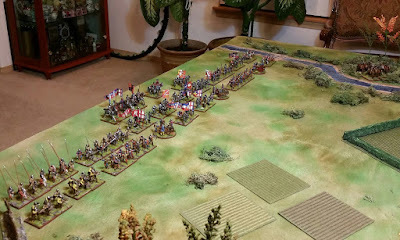 That said, I do try to use them with the sides they were, or might've been, on during the battle. 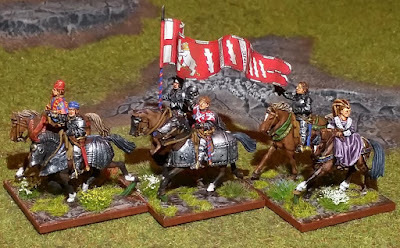 Maybe Edward could've used Warwick's standard as he pleased since the earl was dead and his estate was now his. The Lancastrians from their left. Note the mounted men at arms in the rear as reserve - sporting the Tudor colors - although not present at the battle. Margaret wanted to link up with them before meeting Edward though. 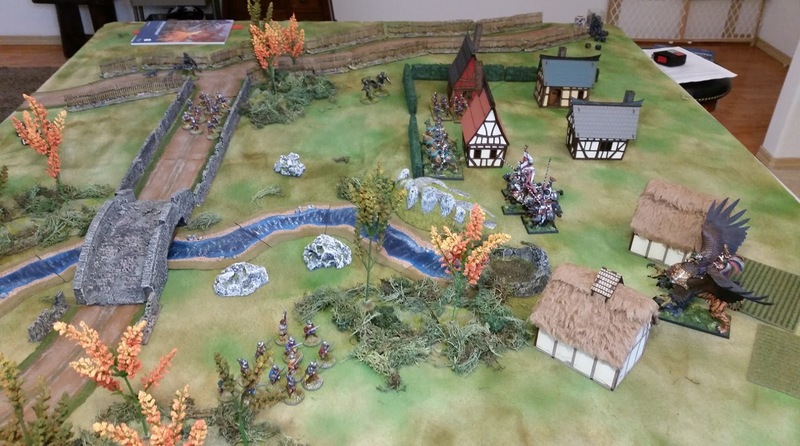 The Lancastrian host from the rear - again from their left flank. 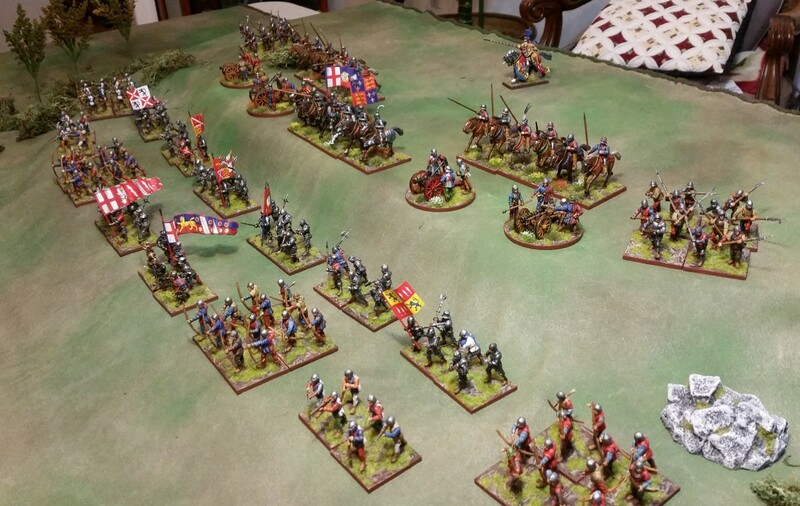 The Yorkists - note the mercenary crossbowmen (in 6-man units) and pikemen on the right flank. 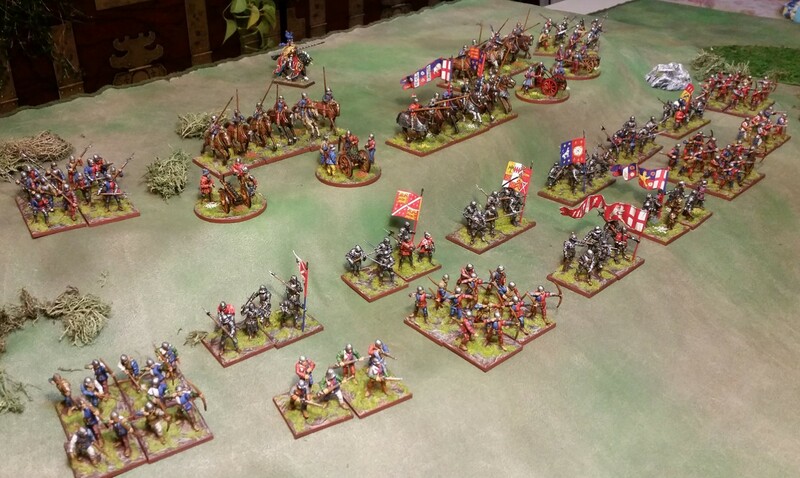 The Yorkists as seen from their left flank. Flemish handgunners (again in 6-man units) on the left flank. The Yorkists have 3 cannon and the Lancastrians only 1 - which they should be happy to have as the Yorkists had captured a lot of their artillery prior to the battle. So much for now, as I don't plan on a play test for this scenario anytime soon. 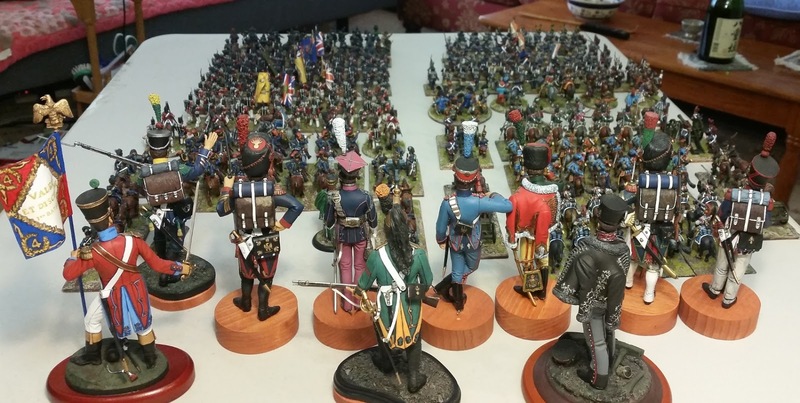 I just wanted to see how the units fit on the rather small 5X6' table. I wanted to be able to use the same mat for this game as the First Battle of St Albans game. Thanks for dropping by! 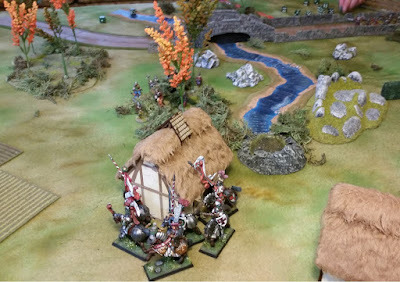 Pics from today's 30 point warband game between the Men of the (Pacific North) West and my buddy Ron's Orcabusiers. 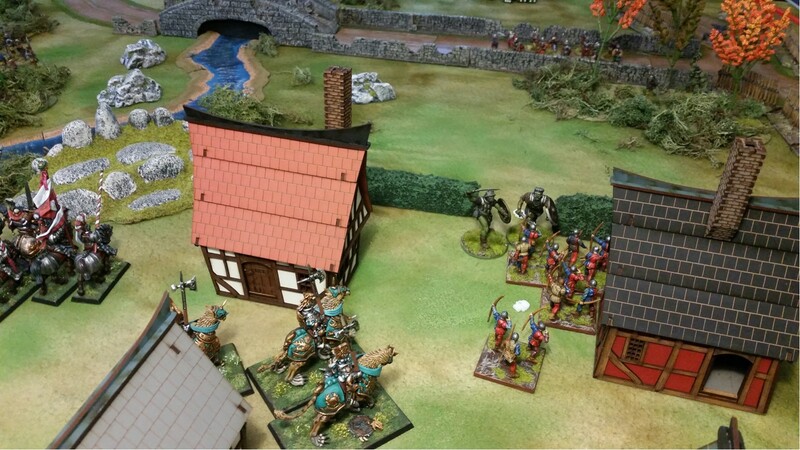 Orc's won - despite both warband leaders being killed off. The "Flying" rule is awesome! 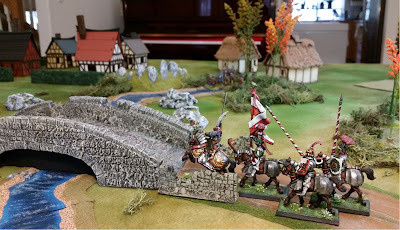 My earl was jumping all over the place! We didn't use any of the scenarios from the book - basically played a straight up fight to the death. 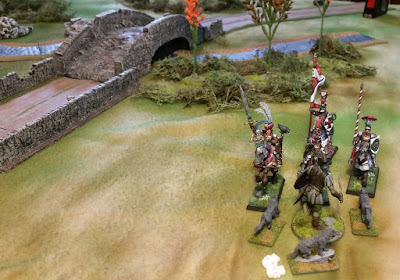 The only "Fantastical" rule used by the Men of the West warband was the Earl's "Flying" trait - which is really cool for jumping over obstacles - including Attacks. 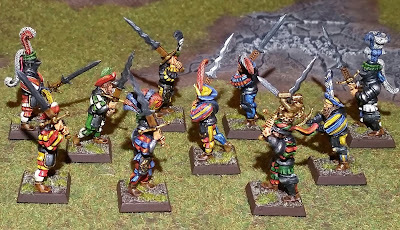 The Orcabusier warband had two Elite Foot units with missiles, which made the Men of West wary of getting within their missile range. 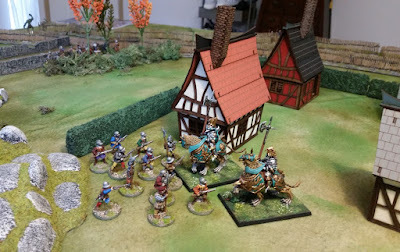 After the archers retreat, the Heroes charge into the Orcabusiers - taking them out after they failed their Courage test. Lancers wisely staying out of enemy bow range - no they are not hiding! The remnants of the Lancer unit advancing on the Orcabusiers - I kept forgetting I paid for Mounted Missiles. Men of Pacific NW leader taking on some of the Orcabusier leader's henchmen. See him hiding after retreating from his lost round of combat. 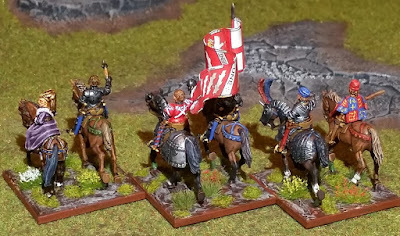 Lancers trying to finish off the Orcabusier leader - which they eventually did. 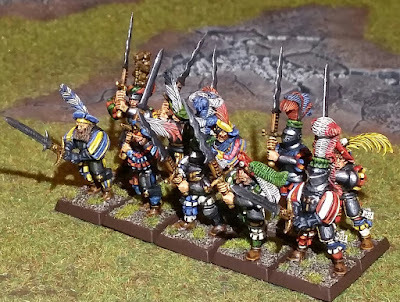 Man, that dude on the left looks so much like Karl Franz! 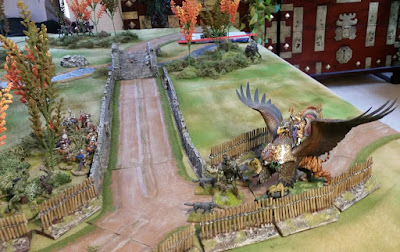 Men of the Pacific NW Heroes mounted on demigryphs take on Elite Foot Infantry (they must've been recruited by the Orcabusiers). 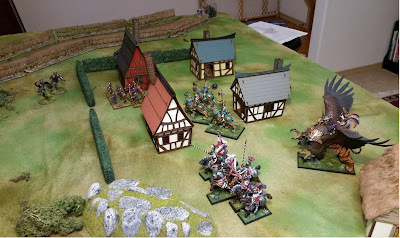 My buddy Ron made good use of the "Fearful" trait to lower a couple of his units by 2 points, thereby increasing the total number of units in his warband. 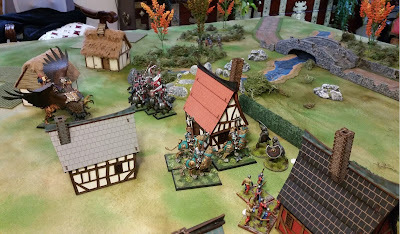 It makes sense since the Men of the West with only 4 units, went to half-strength a lot sooner - which affected Courage tests. Anyway, I'm thankful for Ron driving about 50 miles from Silverdale to my place in Puyallup in very rainy weather. A lot to reflect upon and possible redesign ideas for the warband. Thanks for dropping by and hope you enjoy the pics - it was a fun game. 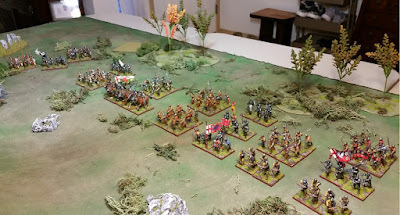 Some staged shots of what I had intended to host at next year's Enfilade convention - Battle of Bosworth using Lion Rampant. 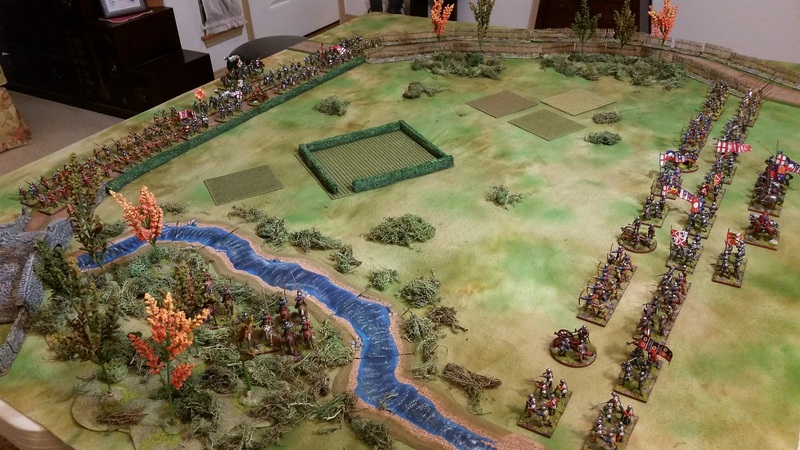 However, the set up (trying to stay historical) seems a bit boring - not really enough natural terrain features for the rules, IMO. 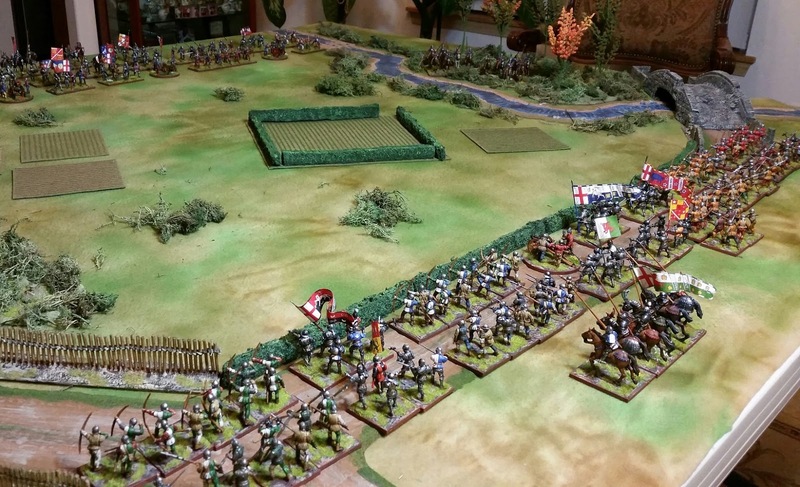 I'm thinking of switching to the Battle of Tewkesbury. This would have a bit more terrain, as well as hidden movement of some cavalry. More to follow. The view atop Ambion Hill with Richard III's forces. 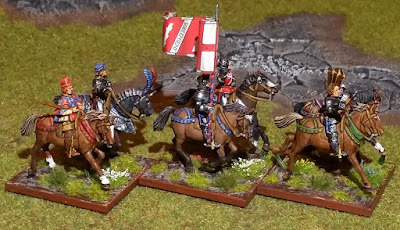 The lone Earl of Northumberland figure represents his retinue - which did not take part in the battle. The view from Henry Tudor's right - with the forces of Lord Stanley to the left of the marshy area where Richard would meet his fate. Richard's army from the left. Henry Tudor's forces with mercenary crossbowmen on his left flank. 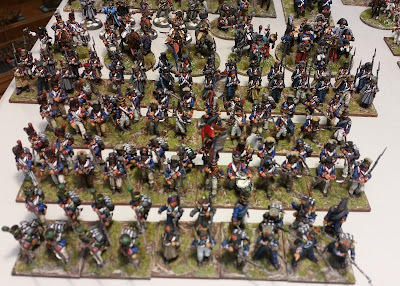 Richard's forces from the right flank. I'm pretty sure the scenario would play out, but it would be mostly a head to head scrum. Possibly a special rule to activate Lord Stanley's forces would make it a little bit more interesting. 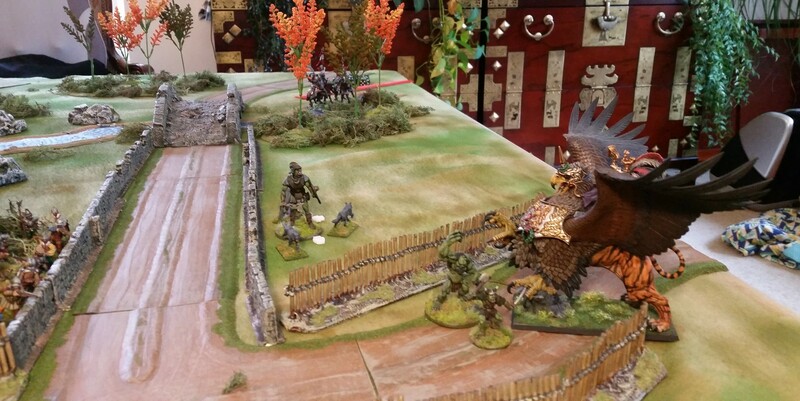 Anyway, I hope to re-set the table for a Tewkesbury scenario. BTW, I gave up trying to stay totally historical with the banners and standards. The noble households were switching sides or dying out far too often.